A close-up of Virgin Gorda gives a better sense of the changes. 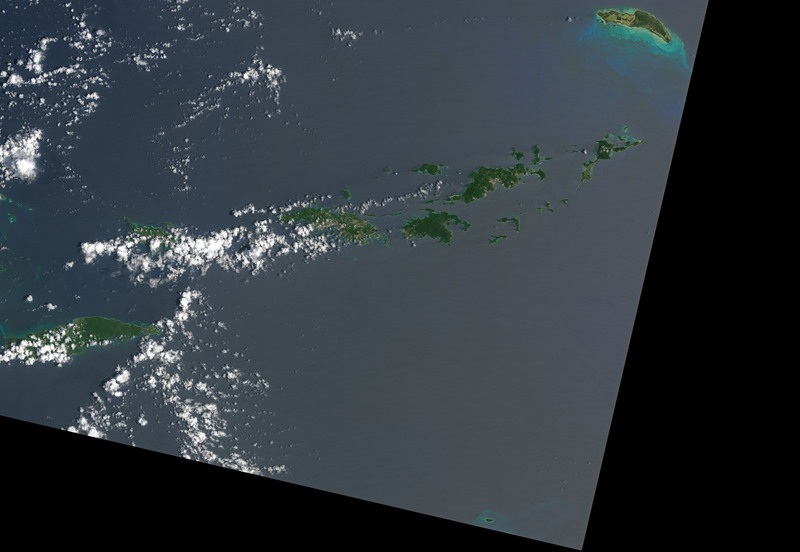 Note how some of the vegetation on the south and west of the island is a bit greener, likely because it was partly shielded from winds by the hills in the center. 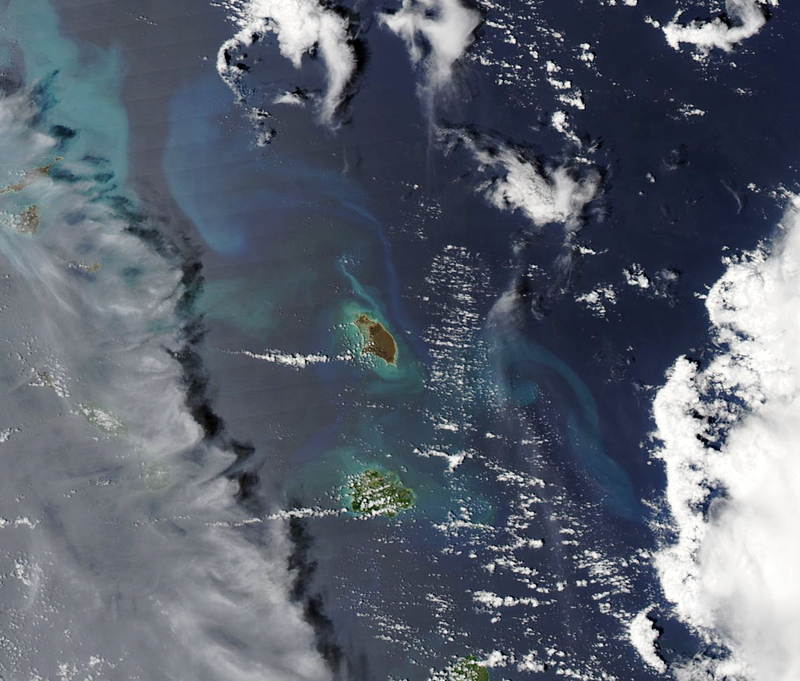 Differences in ocean color likely stem from differences in the ocean surface; rougher surfaces scatter more light, and appear brighter and lighter. The destruction is also clearly visible on Barbuda. 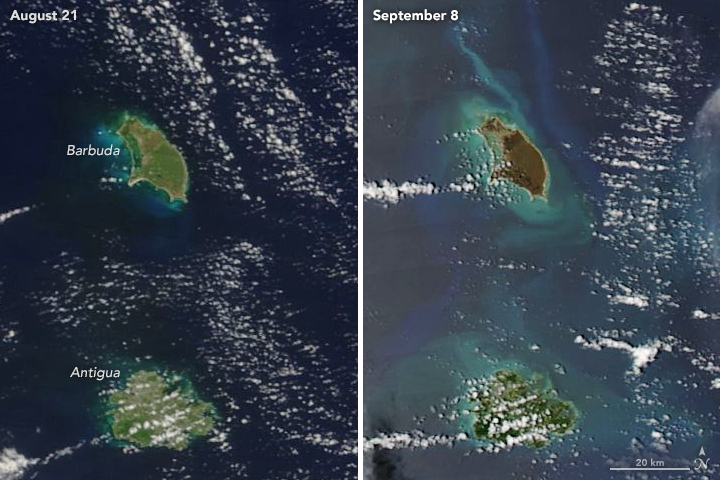 This small island in the eastern Caribbean was directly hit by the category-5 storm early on September 6. 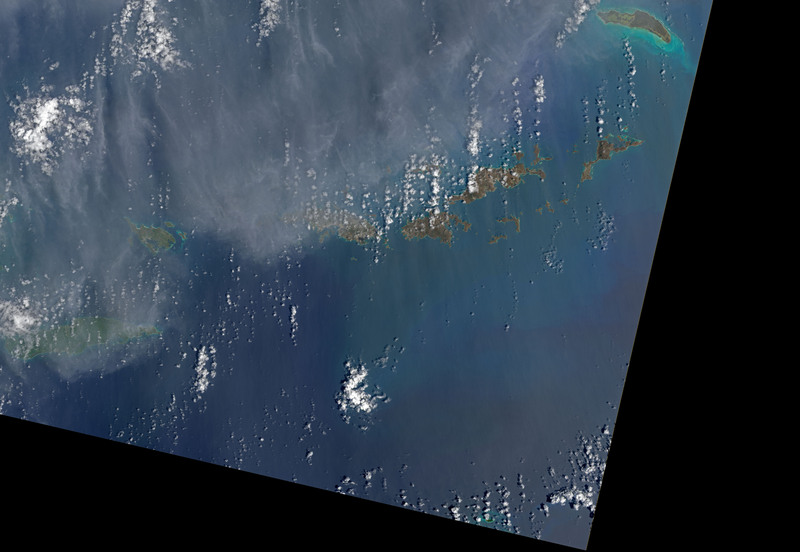 These images were acquired by the Moderate Resolution Imaging Spectroradiometer (MODIS) on NASA’s Terra and Aqua satellites. 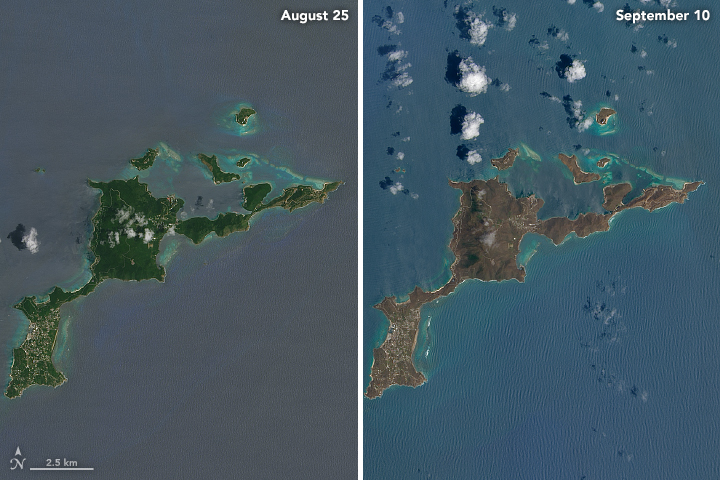 The left image shows Barbuda on August 21, 2017. 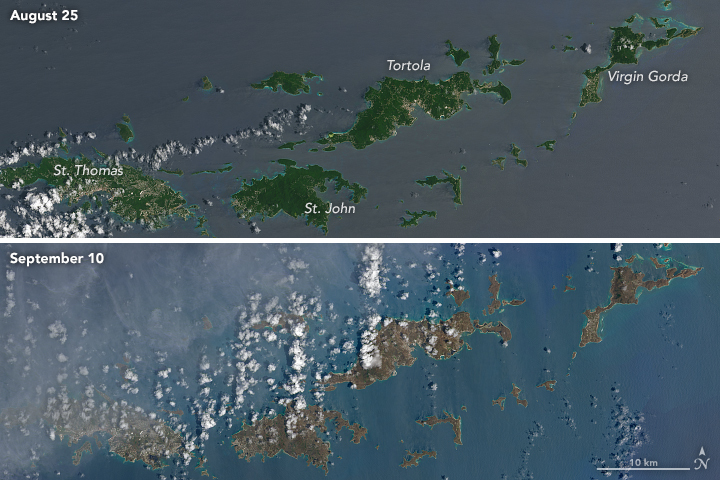 The right image shows the ravaged landscape on September 8.In contrast, vegetation on Antigua appears relatively healthy and intact. 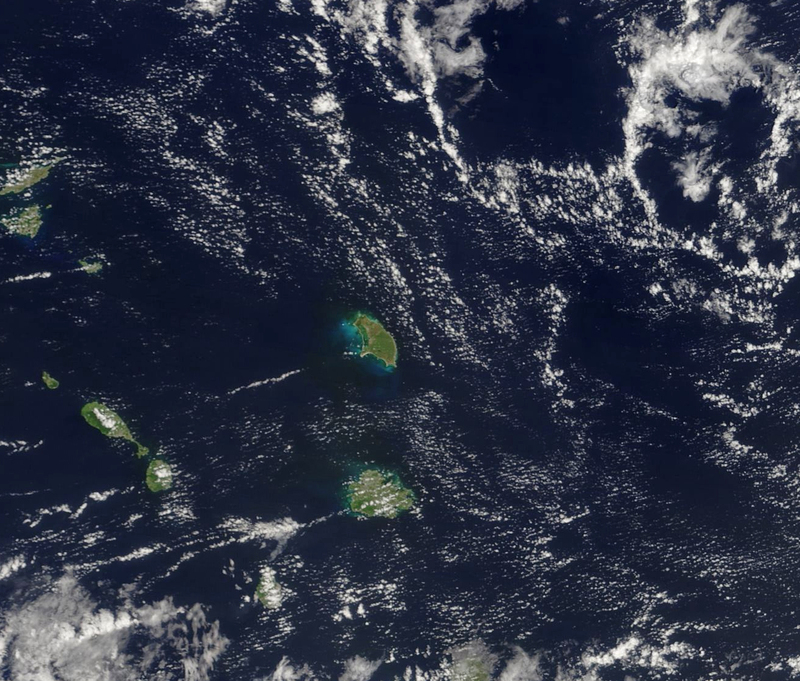 With the storm’s center passing to the north, the island sustained less damage. Ground reports noted that by September 7, electricity had been restored to most of the island, and the international airport reopened. National Hurricane Center (2017, September 6) Hurricane Irma Intermediate Advisory Number 30A. Accessed September 11, 2017. National Hurricane Center (2017, September 6) Hurricane Irma Intermediate Advisory Number 28A. Accessed September 11, 2017. National Public Radio (2017, September 7) Hurricane Irma Leaves Devastation Of ‘Epic Proportions’ In Caribbean. Accessed September 11, 2017. South Florida Caribbean News (2017, September 8) Antigua back to normal, relief under way in Barbuda. Accessed September 11, 2017.